To make the custard, place the cream and milk in a saucepan with the lemon zest and juice over medium heat, bring to a simmer then remove from the heat. Crush the peppercorns and add them to the hot cream and milk, and allow to infuse for 2 hours. Pass the mixture through a sieve, discarding the leftover peppercorns. To make the white chocolate sauce, put the whipping cream in a small pan and place over a medium heat. Heat until it begins to simmer. Remove from the heat and add the chopped white chocolate in three stages, mixing well each time to ensure the chocolate has melted completely, resulting in a smooth sauce. 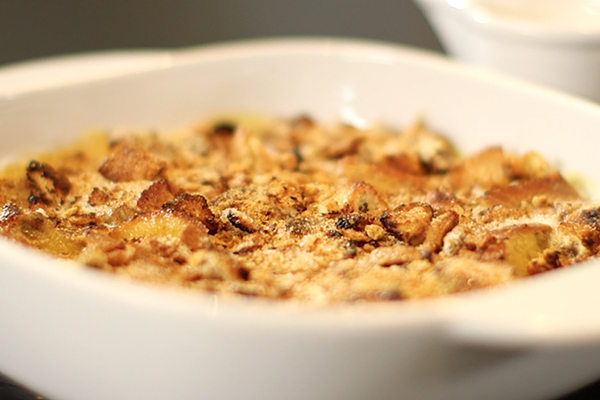 When you’re ready to make the bread and butter pudding, preheat the oven to 165oC. Cut the hot cross buns into large cubes and place on a baking tray. Bake for 10-15 minutes or until golden brown. Remove approximately 250g of the hot cross buns from the oven. Leave the rest in the oven until fully toasted (these will be used as part of the topping later on). To make the caramelised white chocolate, put the white chocolate chunks on a tray lined with parchment paper and bake for 10-15 minutes, or until golden. Remove from the oven and allow to cool completely. Chop into coarse pieces and reserve. Beat the egg yolks together with the honey in a bowl and then gradually add to the milk and cream. Whisk all of the ingredients together thoroughly. Place the bowl over a pan of simmering water and heat, whisking all the time, until the mixture reaches 75oC. Remove the bowl from the heat and whisk in the butter. Place the toasted hot cross buns into a buttered 18cm square baking dish and pour over 650g of the custard. Allow to stand for 20 minutes, stirring occasionally, being careful not to break any of the pieces up. Sprinkle with sugar then place the baking dish inside a larger roasting tin filled three quarters of the way up with boiling water. Bake in a preheated oven at 140oC for approximately 25 minutes. Remove from the oven and allow to stand for 5 minutes. Sprinkle with extra sugar and caramelise the top using a blowtorch, or under a hot grill. Top with the extra-toasted hot cross bun cubes, broken up, and caramelised white chocolate pieces, broken. Serve immediately with the cold white chocolate sauce.